Tonkinese, a cross between the point colored Siamese, and the solid colored Burmese, come in three different body patterns. Image Location & Copyright Info 1) Point Body Pattern: The point body pattern shows a resemblance to the Siamese, having lighter body colors and displaying a high contrast to the point colors (ears, face, tail and paws). 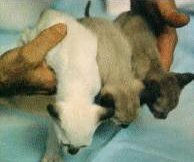 The point body pattern also has the blue eye color of the Siamese. 2) Mink Body Pattern: Considered halfway between the pointed Siamese, and the solid Burmese. Minks have a little more color in the body, but still show a lot of contrast with the point colors. Minks have an aqua eye color. 3) Solid Body Pattern: Resembles the Burmese. They have a deeper body color that displays a subtle contrast with the point colors. Solids have a green to yellow-green eye color. Between the three body patterns, and the four colors, there are twelve possible combinations: Blue Point, Blue Mink, and Blue Solid; Champagne Point, Champagne Mink, and Champagne Solid; Natural Point, Natural Mink, and Natural Solid; Platinum Point, Platinum Mink, and Platinum Solid. To view all four colors and their twelve variations, visit the Tonkinese Breed Association's tonkinese colors page. The Tonkinese eye color is blue at birth, and starts to change around six weeks later. It can continue to change for many months, and more slowly as the cat ages over the years. Normally, Points have blue eyes, Minks have aqua eyes, and Solids have green to yellow/green eyes. If you would like more information and visual aids, feel free to visit Wikipedia, the free encyclopedia. Site developed by Witty1™ Productions: Website design and website promotion for higher visibility!